Founded in 1973, the Academy of St Thomas is based in Norwich and is one of the leading orchestras of its kind. The orchestra is made up of professionally trained musicians from across East Anglia who perform under leading conductors. For the past 33 years, the internationally respected Christopher Adey has been the orchestra’s principal guest conductor. In recognition of his extraordinary commitment to the orchestra he has been invited to become their new Honorary Life President. Two of the Academy’s three regular annual concerts are held in the atmospheric surroundings of St Andrew’s Hall, Norwich. 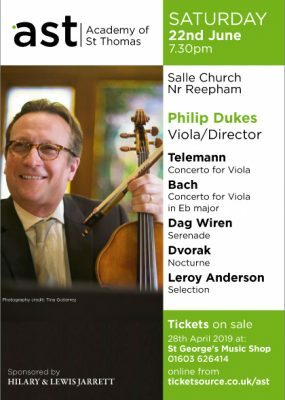 A third and much-loved summer concert takes place in the beautiful Salle Church, near Reepham in Norfolk, with a soloist director. Over the years the orchestra has worked with many world-class soloists such as Emma Johnson, Alexander Baillie, John Lill, John Anderson, Piers Lane, Michael Collins, Lorraine McAslan and Amaury Coeytaux. The orchestra’s philosophy is to offer diverse programming from the orchestral repertoire along with more familiar pieces. The Academy of St Thomas receives no public funding, and is run by players who perform for the love of music. Central to the orchestra’s continued success is the financial support of over 100 patrons, along with a number of generous corporate sponsors.